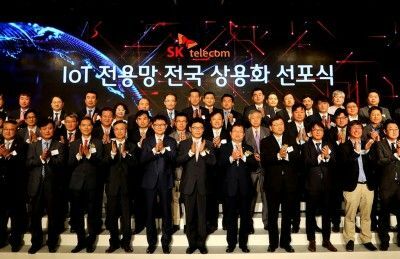 SK Telecom (NYSE:SKM) today held a press conference to announce the completion of the nationwide deployment of Low Power Wide Area Network (LPWAN)* based on LoRa technology; the launch of price plans for LoRa-based IoT services; and its plans to vitalize the IoT ecosystem. The company finished building LoRaWAN across the country by end of June, six months earlier than its initial schedule, covering 99 percent of the population. By securing both nationwide LTE-M and LoRaWAN, which are two main pillars of the IoT network, SK Telecom said that it is now fully ready to create valuable business opportunities in the IoT era. The company had completed nationwide LTE-M rollout in March, 2016. To promote the growth of the IoT market, SK Telecom plans to offer attractive price plans and develop innovative IoT services, while offering strong support for SMEs. To this end, the company will invest a total of KRW 100 billion by the end of 2017. It expects these efforts to lead to rapid expansion of the IoT industry by connecting over 4 million things to its IoT-dedicated networks by the end of 2017. SK Telecom unveiled new price plans for LoRaWAN-based IoT services. The "Band IoT" plans come in six different tiers – i.e. from Band IoT 35 (approx. USD 0.3) priced at KRW 350 to Band IoT 200 priced at KRW 2,000(approx. USD 1.75) - depending on data use (refer to table 1) to allow SK Telecom's customers – both enterprises and individuals - to choose one that suits the needs of their services. The Band Lora plans are highly affordable - costing merely one-tenth of SK Telecom's LTE-based IoT services - and thus are expected to support active development and provision of diverse IoT services by easing the cost burden of startups and SMEs. The company is also offering diverse discount benefits for enterprise customers depending on their contract period and the number of lines they use. For instance, a gas meter, which transmits relatively a small amount of data can be used by signing up for Band IoT 35, while a service that requires real-time communication like lighting control service can be used by signing up for Band IoT 200. Considering the characteristics of the LPWA network, SK Telecom plans to develop services in the areas of metering, tracking and monitoring. In the area of metering, the company is currently focusing on Advanced Metering Infrastructure (AMI)*, which enables the utilities companies to not only accurately measure/monitor usage but also control the metering devices. SK Telecom has been conducting a pilot project on AMI with SK E&S since November 2015, and plans to expand the service coverage to more regions of the country in July 2016. Going forward, the company will launch AMI services for other utilities including water and electricity. Advanced Metering Infrastructure (AMI) is an architecture for automated, two-way communication between a smart utility meter with an IP address and a utility company. AMI is expected to enhance user convenience and safety through its sophisticated remote metering & control features as well as automatic safety capabilities. SK Telecom is also developing in tracking services to identify and track the location of vehicles, people/things, and assets. In cooperation with the local governments, the company plans to launch "Safe Watch," a wearable designed to enhance the safety of children and the elderly in July 2016. Moreover, SK Telecom will offer monitoring services capable of controlling and managing manufacturing/public/commercial facilities. For instance, monitoring service for a company that has a large-scale production facility will ensure that the equipment within the facility are operated in an optimal manner and the production environment is kept safe at all times. Environmental monitoring of CO2 concentration, temperature/humidity, as well as hazardous substances – e.g., measuring concentration levels of radon in the atmosphere and soil – can also be provided. In August 2016, SK Telecom will start an environmental monitoring service at Changjo (Creative) Village in Sejong. Furthermore, the company plans to launch a total of 20 LoRa-based IoT services by the end of 2016, including a manhole monitoring service (in September) and a real-time shared parking service (in October). Besides developing and launching IoT services of its own, SK Telecom will be making multifaceted efforts to vitalize the IoT ecosystem by encouraging the participation of developers, SMEs and startups. To this end, the company plans to set up a comprehensive program named 'Partner Hub Program' to nurture partners. Through the program, SK Telecom will share its expertise and knowhow, provide training and conduct joint development/ marketing. To support the development of IoT services and devices, SK Telecom will create a space called 'IoT Open Testbed' for SMEs and startups at its Bundang Building to offer a one-stop development environment - which encompasses network, device and platform - for IoT services. At IoT Open Testbed, SMEs and startups will be able to verify their IoT devices, carry out tests to check interworking between their device and the IoT network/platform, and receive technical/service consultation. SK Telecom also began providing LoRa modules free of charge on July 1, 2016. Aimed at facilitating the development and launch of LoRa services, the company will provide a total of 100,000 units of LoRa modules for free. Also, the low cost of the LoRa module – which is just one-fifth of that of an existing LTE module – will contribute to the development of the wide variety of IoT devices. "SK Telecom is proud to announce the nationwide deployment of LoRaWAN as it marks the first important step towards realizing connectivity between infinite number of things, going beyond the traditional role of telecommunications centered on connectivity between people," said Lee Hyung-hee, President of Mobile Network Business at SK Telecom. "Going forward, SK Telecom will develop and offer a wide variety of IoT services designed to offer new value for customers, while working closely with partners including SMEs and startups to vitalize the IoT ecosystem."